Something about summer and seafood just go hand in hand. I know that when I go down to the beach with my family, I love to indulge in some delicious fresh seafood. At home I love to get my seafood from seafood markets, but there is also nothing wrong with supermarket buys. Just make sure it looks fresh and doesn’t smell super fishy. Another great tip that I learned through the years is to ask the counter person to add ice to your seafood, this is great; especially in summer months when taking your purchase home. 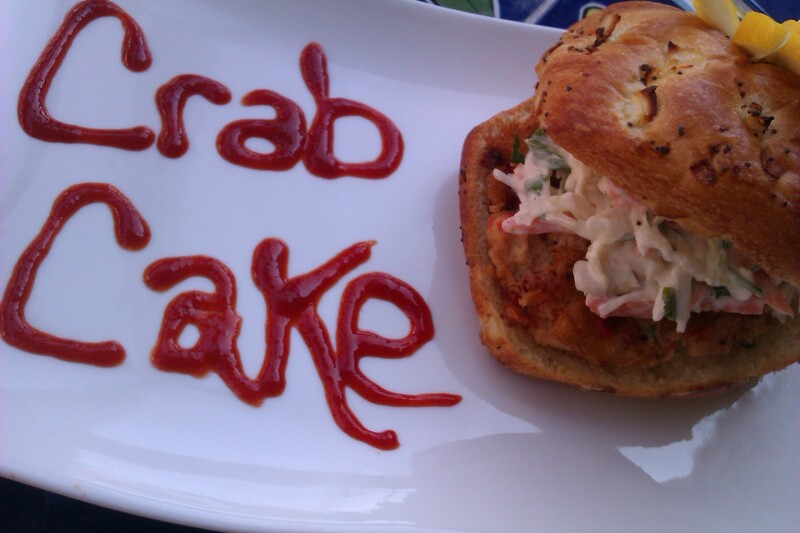 My kiddies were asking me to make crabs, so I told them why not crab cakes in a sandwich. They were all for it and of course the hubby had no complaints either. If you’re a lover of seafood this is a must try crab cake sandwich. Enjoy and happy summer. Crush the saltines with either a rolling-pin or hands. Place them in a large bowl, with crabmeat, bell peppers, parsley, onions, old bay, powered mustard and mayo. Mix gently and begin to form patties (whatever size you prefer). Place them on a cooking sheet and place in the refrigerator for about 15 to 20 minutes. Place oil in a large skillet on medium heat. Then add the patties cook for about 4 minutes ib each side until you get a nice crispy golden brown color. When done place on a paper towel to drain. While the patties are cooking up. Take your ingredients for the slaw and mix together in a medium bowl.When Crab cakes are done place them on your onion roll and top with slaw. Enjoy! Oh yum! I haven’t had a good crab cake in a very long time. We LOOOVE crab cakes! I order them every time I go to a seafood restaurant. I’m going to have to try these. I absolutely love crab cakes! Thanks for the finger licking recipe!